Black women are likely to develop physical limitations earlier in life than others their age, according to a new study. Researchers from Case Western University in Cleveland analyzed self-reported information on the mobility, strength and physical limitations of more than 8,700 older people included in the 1994-2006 U.S. Health and Retirement Study. The participants ranged from 53 to 75 years old. The study found a higher rate of physical problems among black women in their 50s and 60s in the study of black, Mexican-American and white men and women. 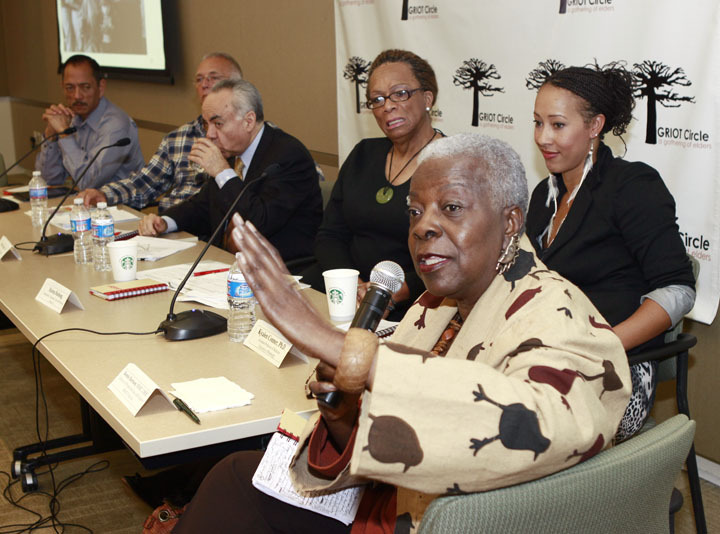 “We could not find the reason why African-American women developed limitations faster than other gender and racial/ethnic groups,” said David Warner, assistant professor of sociology, in a university news release. After their mid-60s, however, the rate at which disabilities occurred among black women began to decrease, and by age 75 the rate leveled off, the study found. For the study, recently published in Social Science & Medicine, the researchers also examined the participants’ early life experiences, socioeconomic status, marital status and health-related behaviors to determine how these factors might affect people’s disabilities. 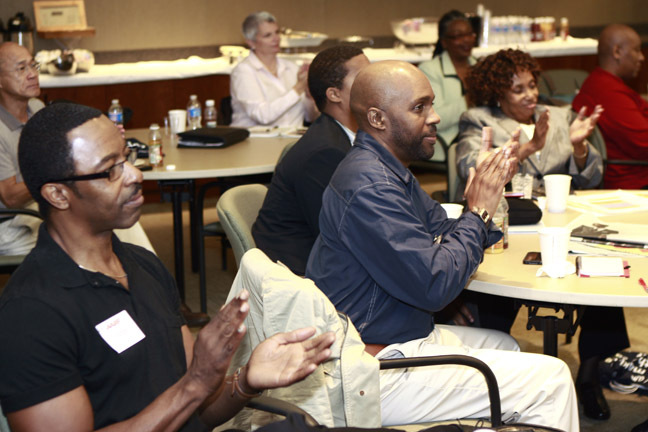 Men of all racial and ethnic groups fared better than women the study found. Better-educated, wealthier men, in particular, reported fewer physical health issues. Women are at greater risk for disadvantages, such as lower incomes and lack of health care in midlife, which may have lifelong effects, the researchers said. At age 75, Mexican-American women fared worst — with nearly five disabling limitations, twice as many on average as white men — the study found. The study authors said future research should address the unique health experiences of older black women. 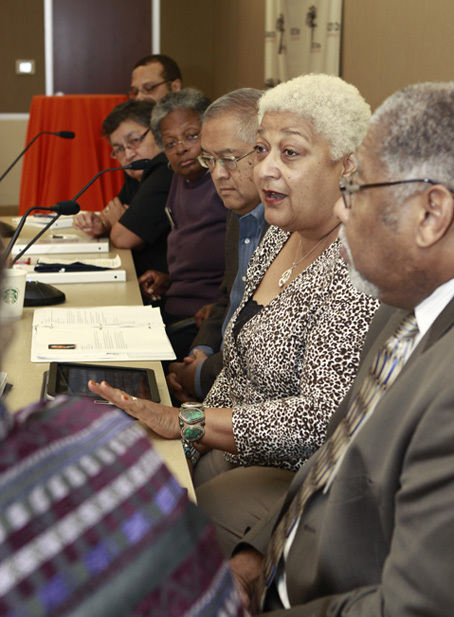 Preventive efforts are also needed to eliminate racial- and gender-related functional health disparities, they said. The U.S. National Institutes of Health funded the investigation. via Black Women Tend To Suffer Disabilities Earlier In Life : The Black Health Zone :. It is with heartfelt gratitude I express THANKS to everyone for your presence, for your participation both during and after, for the beginning of a national movement/network, however you choose to define it, that will address issues pertaining to POC LGBT aging. 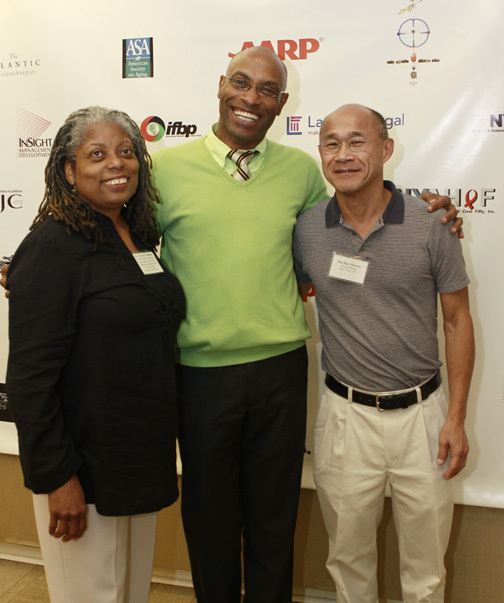 The First National Convening on POC LGBT Aging was a phenomenal gathering, please applaud yourselves for a job well done!! Glen-Michael Francis, Exec. Dir., GRIOT Circle. 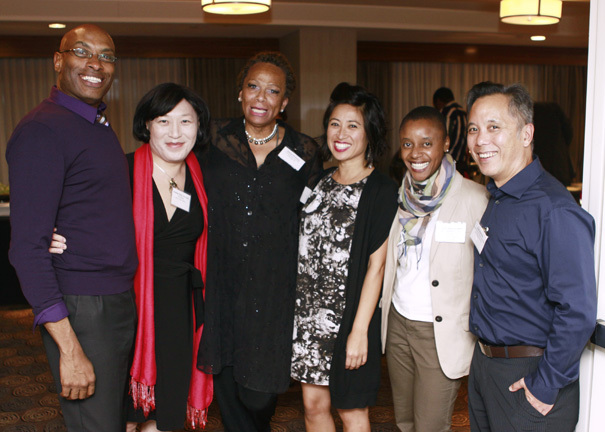 To all the staff of GRIOT Circle…Bonnie Harrison, Anthony McPhatter, Victor Pond and Daniella Noel who went beyond the call of duty and put their brightest foot forward to create an outstanding Convening. To Brian de Vries for always being informative and supportive, a man of truth and clarity. To Kyaien O. Conner for your brilliance and impressive level of research that opened so many people’s eyes to the disparate needs of LGBT POC aging. Your presentation was amazing! Thank you. Chezia Carraway, my Elder Mentor Sister Friend, lots of love! Thanks! And to Helena Bushong for being the voice of our Trans-elder community that is far too often invisible at these important gatherings. You rock! Aisha Young for continuing to be the leader that you are! Laurens Van Sluytman for always being in GRIOT’s–and my–corner, a guy you can count on! Much Love! Jay Blackwell you know how I feel about you and your support! Louis Colbert for your kind words, as you know, we got work to do!!!! Carmelita Tursi for always being so very understanding and supportive, and for being available and open to the new kids on the block! Talk soon!? Hutson Inniss for coming in and doing the work necessary, thanks man! Jewelle Gomez for being a great elder and movement leader. Nancy Bereano, your mentorship and love is felt! Brendalynn Goodall, my SISTA friend, for always having my back and just being a great supporter friend! To Michelle Alcedo, my SFAM, for your continued energy and support! Hope Barrett great seeing you as always, thanks for your words of encouragement. Rev. Jaynce Jackson thanks for your words and for keeping everyone focused on why we were there. To Sharon Day for bringing our native brothers’ and sisters’ voices to the table! Don’t forget to say hi to Jackie for me! Pauline Park thank you, it’s always good to have your voice in the room! Tony Sarmiento what can I say, let’s make some noise, your brother in the struggle! Mr. Bryan Epps from the moment I reached out to you, you were on board and have remained consistent in the process. Thank you. Let’s have lunch soon! Mario Tapia we have got to do some more work together, let’s present our own initiative to the City Council and get it funded. Call me! Carmen Vazquez thanks. That’s all I can say, thank you!! Dion Wong you brought a new clarity to the meaning of working in POC communities, I am humbled. Dr. Rawha Haile, who was scheduled to be at the convening, was unable to attend because her father passed away. I want to take this time to send out special thoughts of comfort, and a blessing to you and your family in celebration of your father’s amazing life! Cheryl Reese thank you for being that voice in the room! We got your information. Imam Daayiee Abdullah thanks for lending your expertise to this conversation! Tracy Cooper you hit this one out the ballpark! I knew you would! 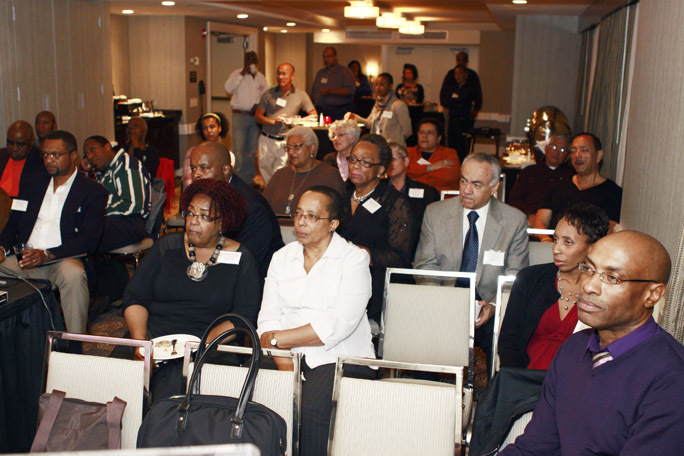 To Edwin L. Walker, Senator Benjamin Cruz, the ASA/LAIN and all the participants I met … WE THANK YOU ALL. 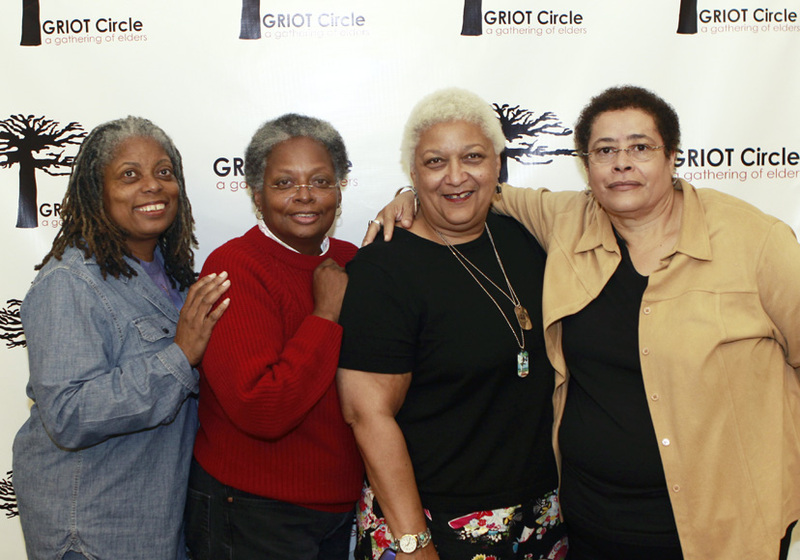 GRIOT Circle is committed to working within and with the systems/committees to develop structure and support for the network. 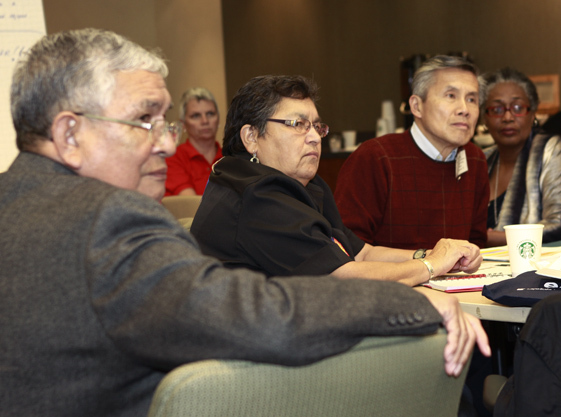 We are also here to help with whatever else we can to move this project forward. 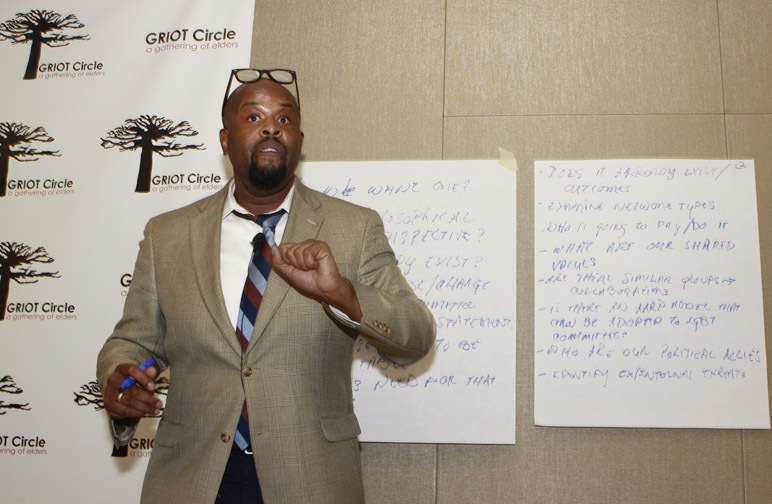 As I said during the closing plenary, it was not designed for GRIOT to be in charge of the network, that power is yours, it has to be organic and coming from the members, much like how we run GRIOT Circle. We were the vehicle to bring us all together, now let us all build a network we can all be proud of. 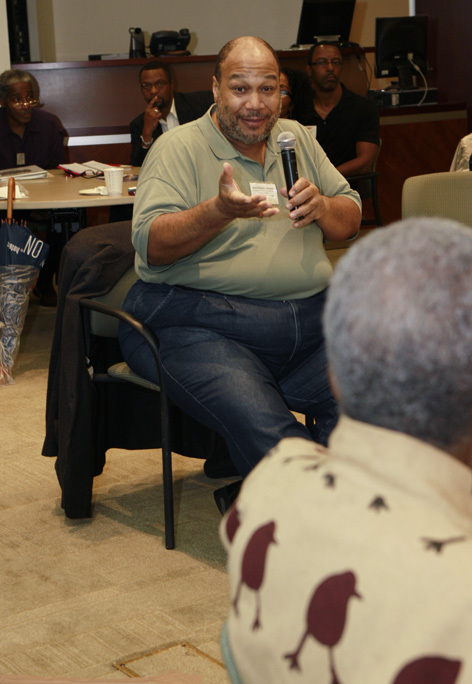 On the final day of the First National Convening on POC/LGBT Aging, hosted by GRIOT Circle in collaboration with AARP at the Brickfield Conference Center, participants tackled the challenges of forming the first national professional network and shaping the mission and vision of the network; Laurens Van Sluytman, PhD facilitated this process. 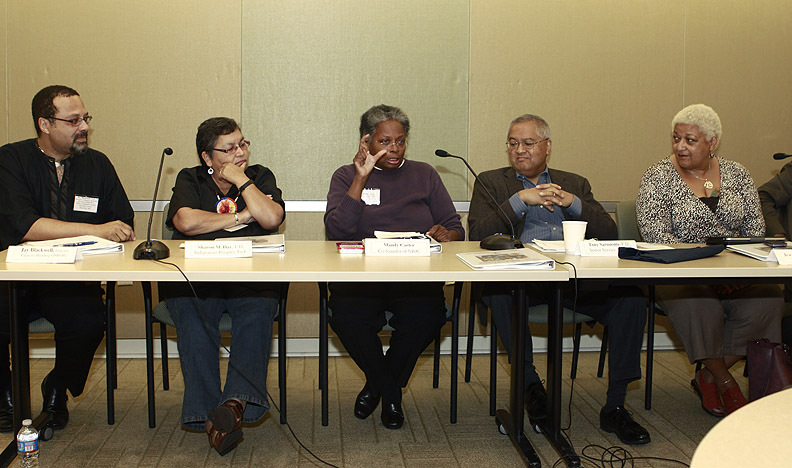 The Panel: Senator Benjamin Cruz, Brian de Vries, PhD, Mario E. Tapia, Helena Bushong and Kyaien O. Conner, PhD, LSW, MPH. 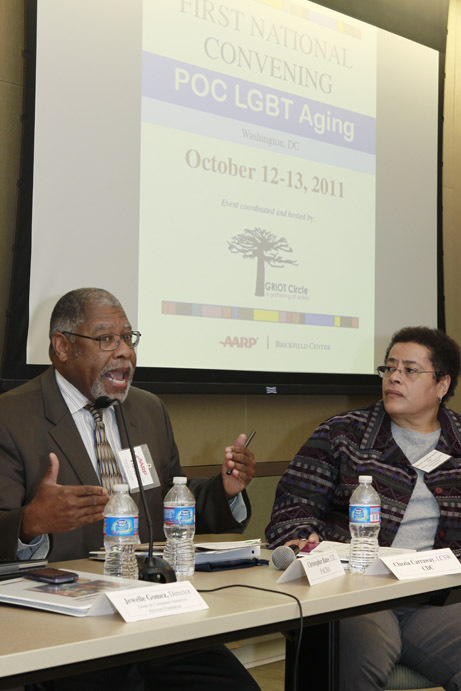 The morning began with a facilitated discussion about Positive Aging, with a panel led by Bonnie Harrison, MSHC. 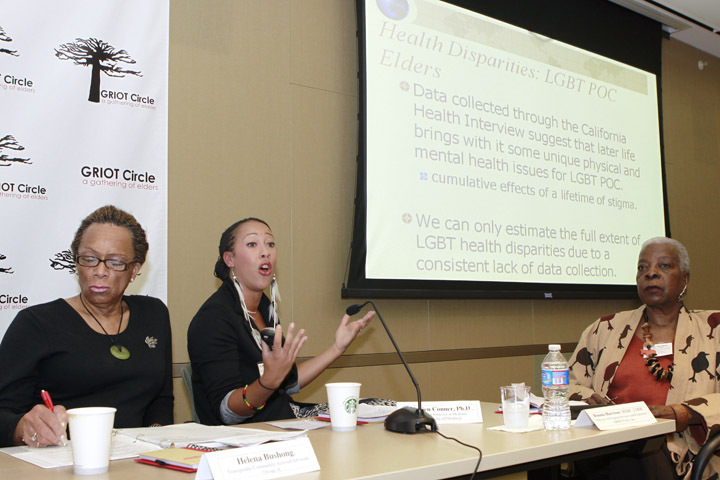 Panelist Dr. Kyaien O. Conner, from the University of Pittsburg School of Medicine Department of Psychiatry, delivered an excerpt of a highly impressive and comprehensive report that contained startling health disparity statistics on the POC/LGBT communities. Her research findings are a wake-up call to the national policy makers to address these critical and frightening statistics as the nation becomes more elderly. 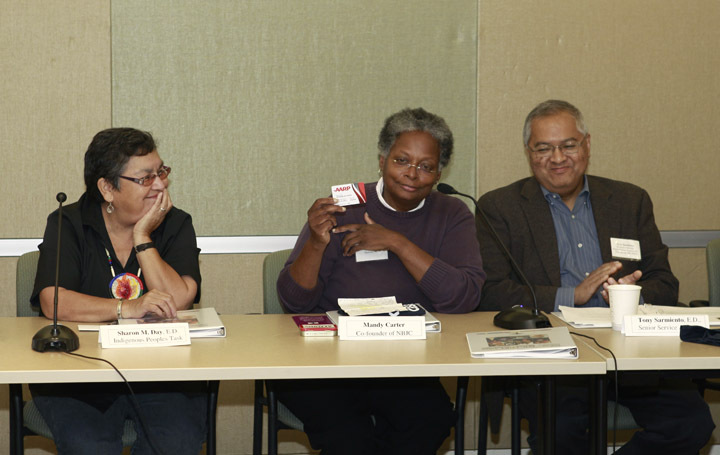 Dr. Kyaien O. Conner (center) presents an excerpt from her research on disparities faced by POC LGBT elders. Panel facilitator Bonnie Harrison, MSHC (foreground). The Honorable US Senator Benjamin Cruz of Guam, hit home the need for the federal government to recognize marriage and create equality for the LGBT community, specifically for seniors. None of the 1400 benefits enjoyed by heterosexual couples are provided to LGBT couples, which in turn has dire implications on LGBT seniors who have lost their partners and are left with income losses, sometimes as much as 70%. 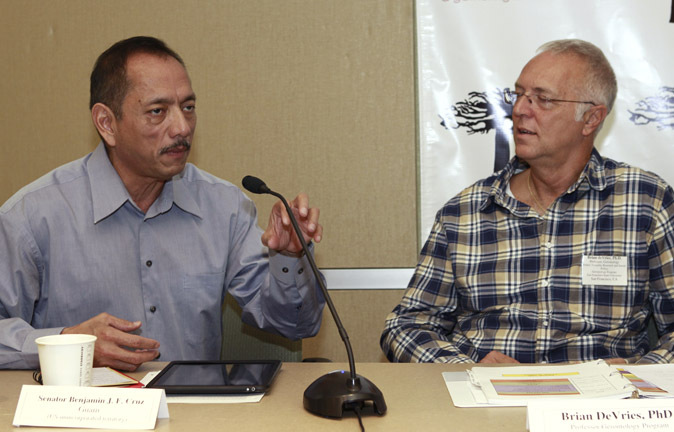 Senator Benjamin Cruz and Brian de Vries, PhD. 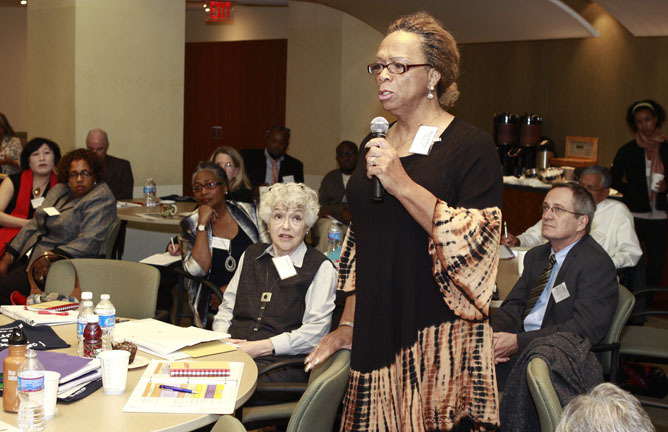 Trans-elder activist Helena Bushong contributed to the dialogue on health and economic disparities within the Transgender community, and the complications of living with comorbidities, as the lack of research in Transgender communities can prove to be fatal in some cases. 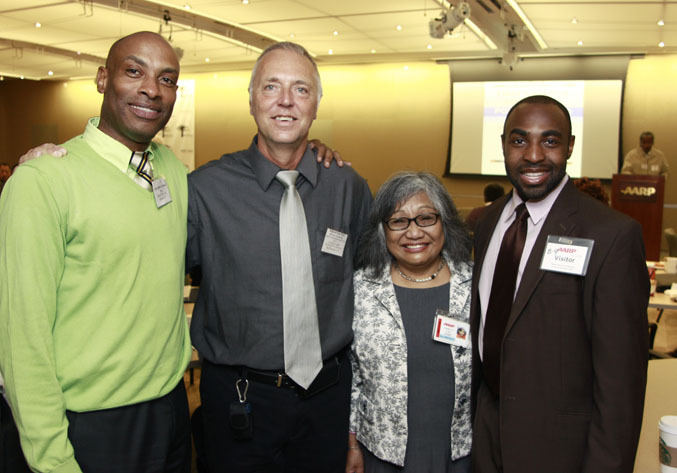 Brian de Vries, PhD, Mario E. Tapia, Helena Bushong and Dr. Kyaien O. Conner. Nancy K. Bereano, retired publisher, gave the keynote address about the value of community and support as we age. 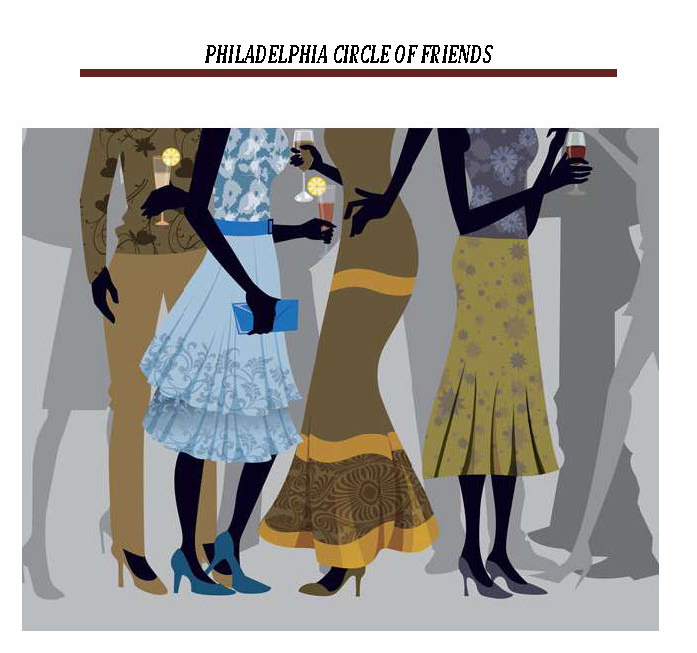 She referenced a dear friend, who at 62, was diagnosed with cancer and built a network of friends to support her with the quality of her end of life process. GRIOT Circle has taken those recommendations to heart and will incorporate them into our Buddy-2-Buddy program going forward. This area was the missing link in the codification of this particular program. This session sparked thought-provoking questions around organizational self-identity, as well as capacity levels available to support the future development of the network. Some of the questions participants presented and attempted to address include: Who will develop a mission and policy statement? Are we going to be volunteer-driven, how is that going to look and how exactly will the committees be formed? Imam Daayiee Abdullah, Dir. LGBT Services, Muslims for Progressive Values. 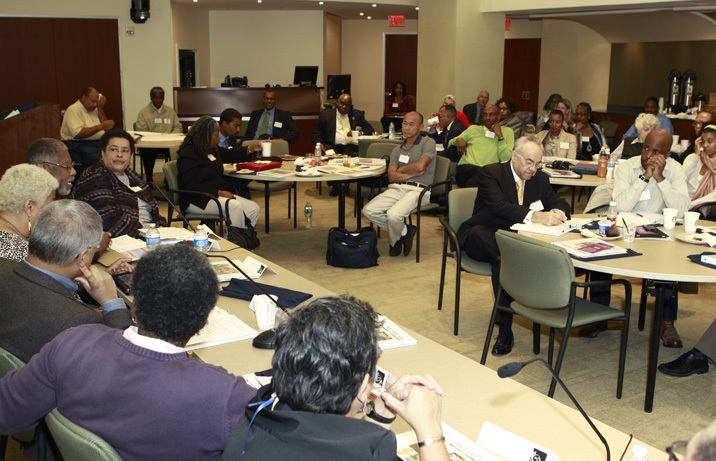 How do we provide funding, technical and organizational support to each other on a national level (i.e. AARP/ ASA relationships)? What would those relationships look like? 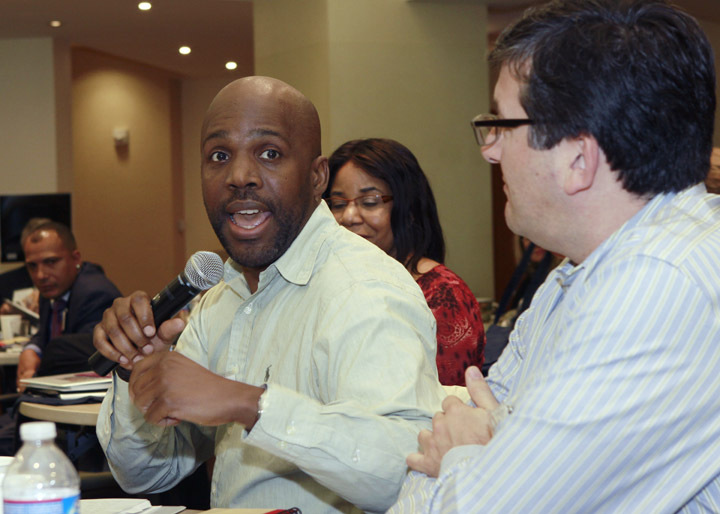 How do we handle the issue of members’ intellectual property sharing, as well as, broader issues of information sharing, including research findings, programs and services to promote the strength of organizations in the network? Taike S. Brundige and Curtis Lipscomb applaud Dr. Conner's impressive research work. Rev. Jaynce Jackson, Mandy Carter, Jewelle Gomez and Chezia Carraway, LCSW, PHE. 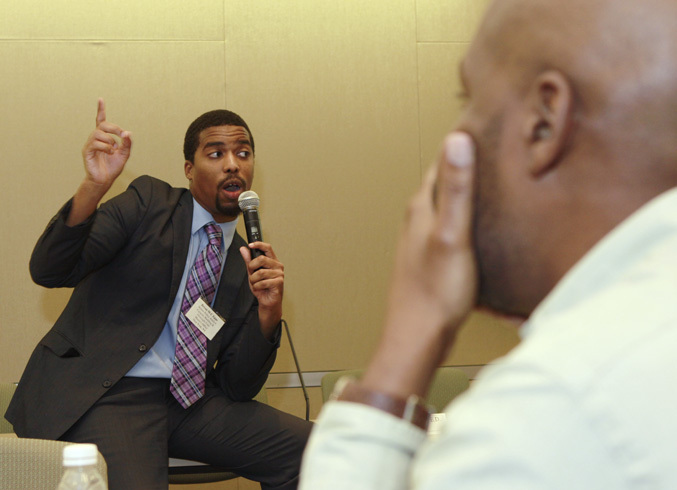 Please revisit our blog for additional reports, outcomes, updates and first-person offerings from participants at the First National POC LGBT National Convening. Successful aging requires access to approximate housing, quality health care, and supportive services – needs that will challenge and transform the system entrusted with providing these services for a rapidly expanding aging population. At the same time, the growing numbers of lesbian, gay, bisexual, and transgender (LGBT) seniors and their increasing degree of openness and demands for fair and equal treatment are further challenging the elder care system to meet the needs of all seniors. This shift signals the urgent need to radically transform and redesign gerontological and geriatric health care paradigms. 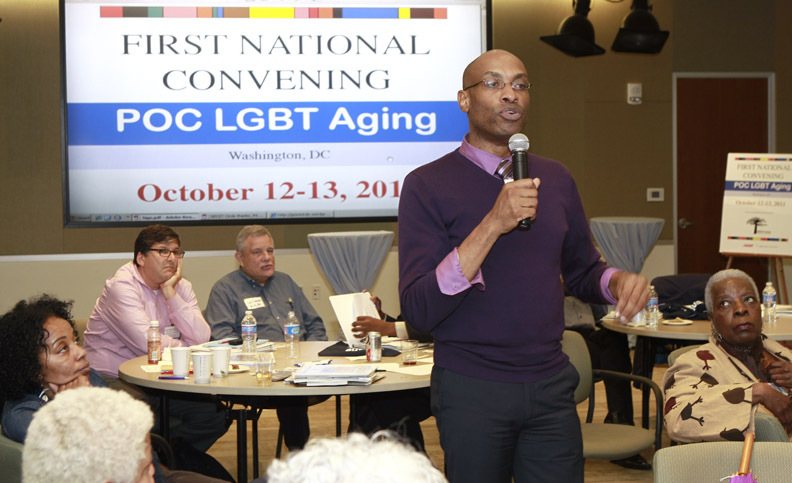 Workshops on day one at the First National Convening of LGBT Aging Professionals. 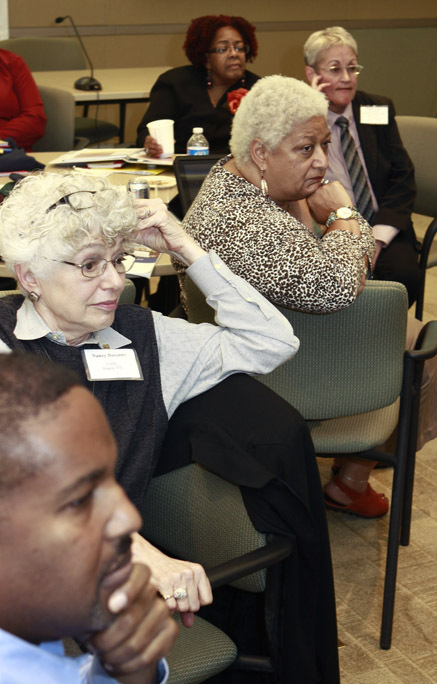 Older Americans are also growing more radically and ethnically diverse. In 2000, an estimated 84 percent of persons aging 65 and older were non-Hispanic white, 8 percent were Hispanic, 2 percent were Asian/Pacific Islanders, and less than 1 percent was Native American/Alaska Native. Brendalynn Goodall, MSW and Carmen Vazquez, Coordinator, AIDS Institute. 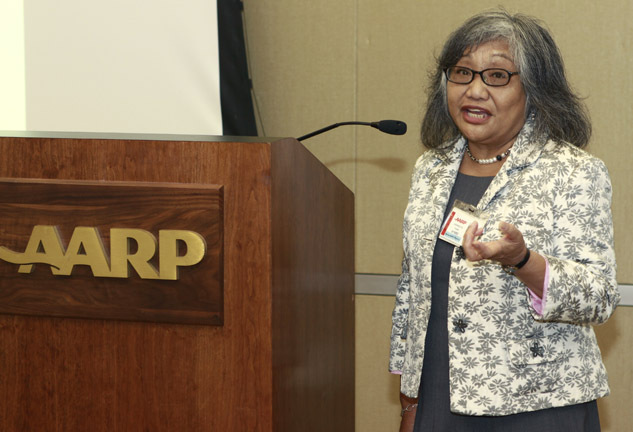 By 2050, estimates indicate that approximately 64 percent of persons age 65 or older will be non-Hispanic white, 16 percent will be Hispanic, 12 percent will be non-Hispanic black, and 7 percent will be Asian/Pacific Islanders. 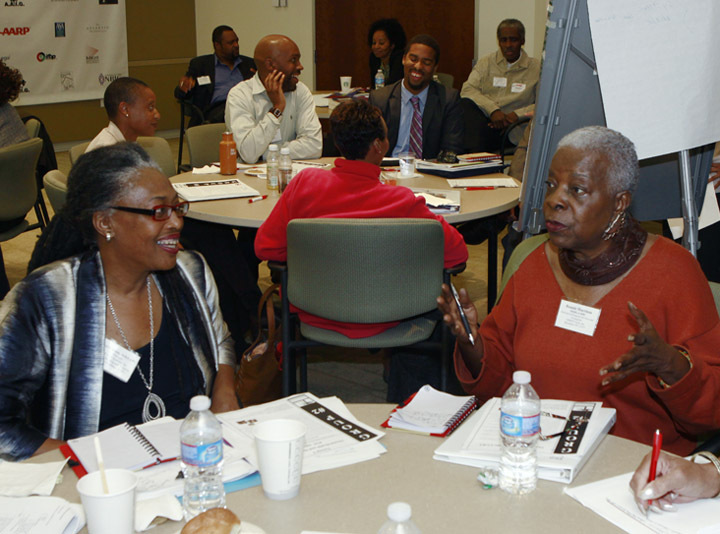 Service providers must take this growing diversity into account as they strive to provide quality services that genuinely meet seniors needs. 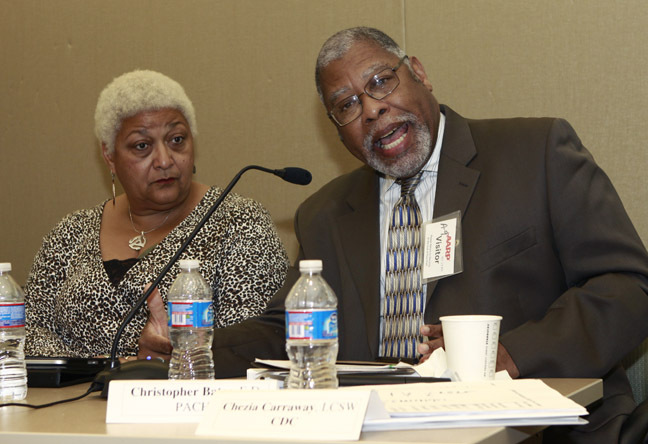 Curtis Lipscomb, Executive Dir., KICK--The Agency for LGBT African Americans. 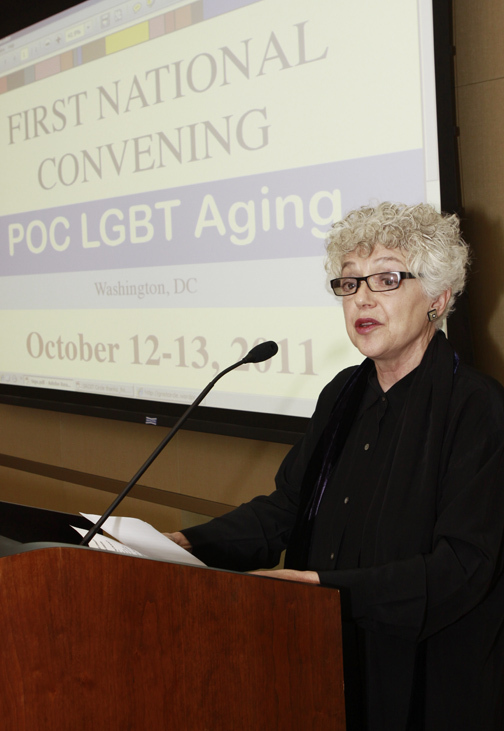 All elders contend with many of the same aging-related issues, however, LGBT seniors and people of color (POC) LGBT in particular face many unique challenges. These seniors are “thrice-Hidden” due to social discrimination on levels: ageism, racism, homophobia and heteroism. Benjamin J. F. Cruz, Chairman Committee on Youth, Cultural Affairs, Procurement, General Governmental Operations, and Public Broadcasting. LGBT seniors often face anti-gay to gender discrimination by mainstream elders care providers that renders them “invisible” and impedes their access to vital services. 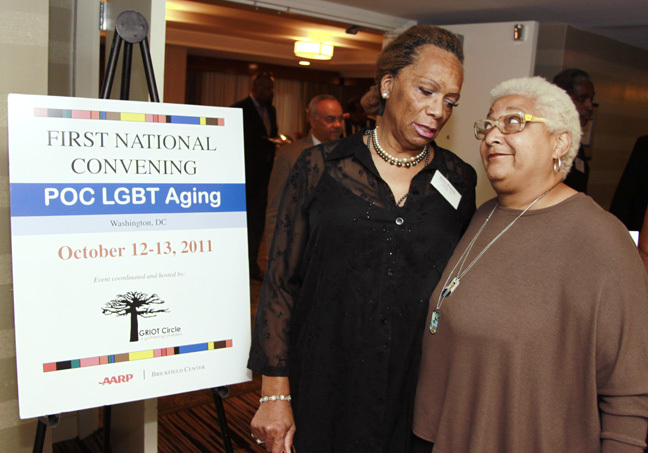 At the same time, LGBT elders frequently confront ageism within the LGBT community and the organizations created to serve the community’s needs. Jewelle Gomez and Christopher Bates, CEO, PACHA. 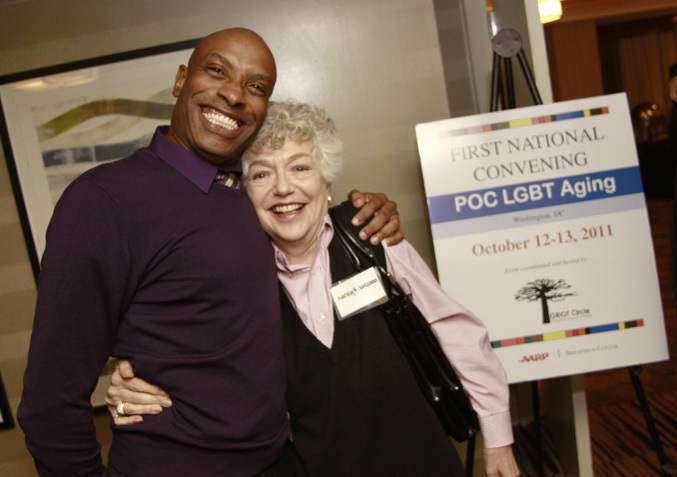 This First National Convening on POC LGBT Aging is a collective declaration of the urgent need to reframe and transform the conventional “aging” health care landscape as it directly impacts POC LGBT elders. We must move beyond problem solving in isolation to forging sustainable and innovative collaboration among aging, health and LGBT network. 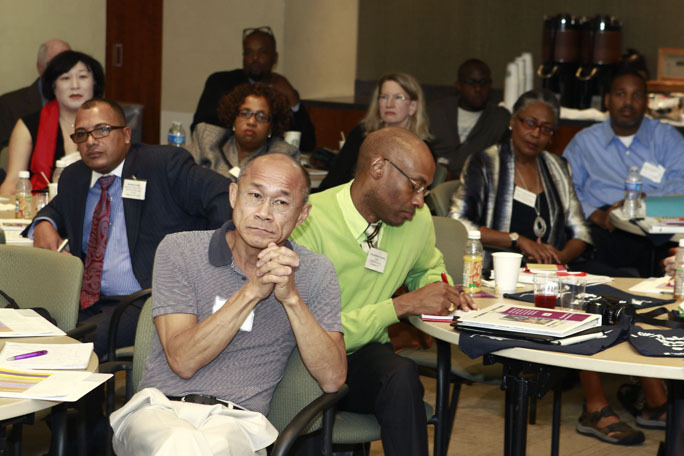 It is essential to collectively advocate for the integration of both ethno-geriatrics and adult transformational learning into all aspects of health care delivery for POC LGBT elders. 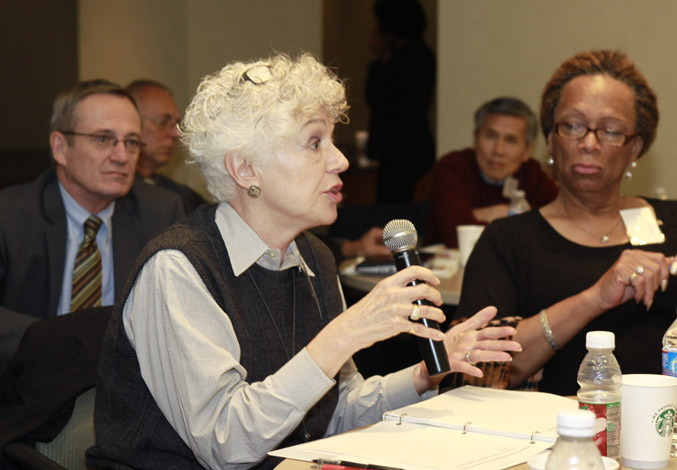 This is a crucial time for advocates to communicate, hold each other accountable and present a untied front, especially during this period of national debate over the future of federal programs critical to the well-being of seniors. 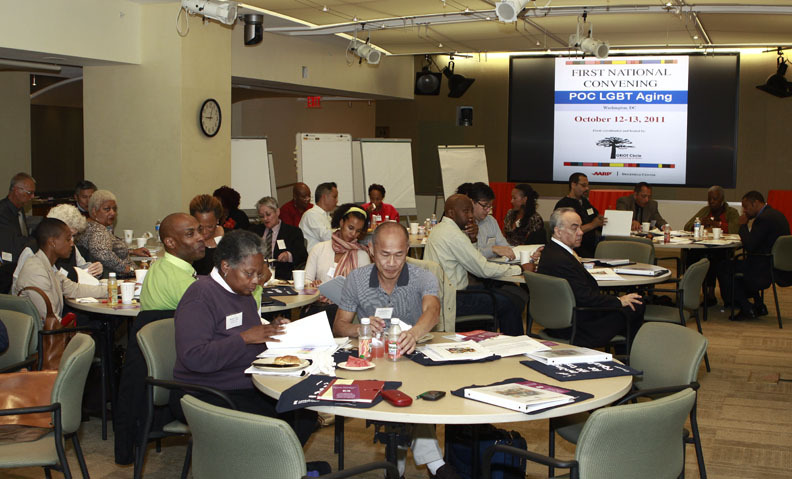 Oct. 11, 2011, Washington, D.C. — Professionals on aging in the people of color LGBT community arrived in the nation’s capital today for the First National POC LGBT Convening on Aging. 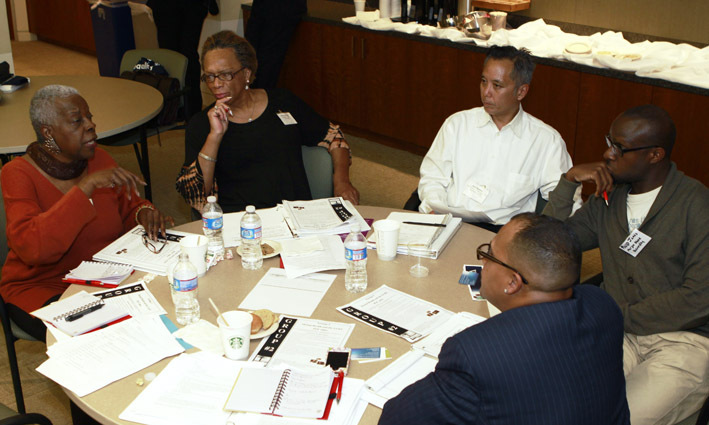 The two-day convening intends to build a network that strengthens alliances and fosters ongoing collaborations and broader discourse on issues, challenges and policies that effect the elder POC LGBT community. 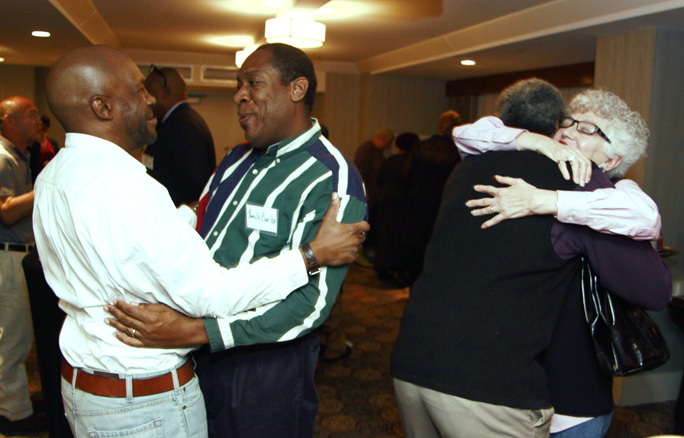 The conference is a collaboration of the American Society on Aging‘s LGBT Aging Issues Network (LAIN) and GRIOT Circle, and is hosted at Brickfield Center with generous support from AARP and funding from The Atlantic Philanthropies. 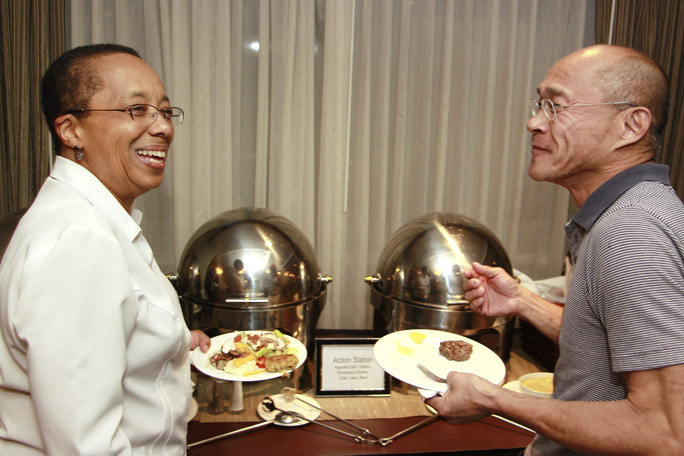 The networking and opening reception allowed colleagues to meet and greet, some for the first time, and break bread together, before tackling the itinerary of workshops, small group sessions and facilitated panel dialogues on Wednesday and Thursday. The evening closed with attendees screening three short film projects that document the trials and triumphs of some members of the elder POC LGBT community. 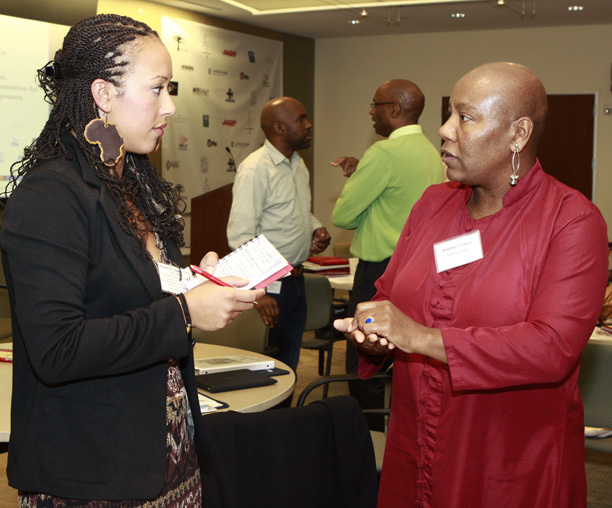 Michelle Alcedo of Openhouse in San Francisco showed her work-in-progress, GRIOT Circle shared the first installment of its Elders Speak series, and Hope Barrett of Center on Halsted in Chicago showed a portion of their documentary on LGBT elders living with HIV. 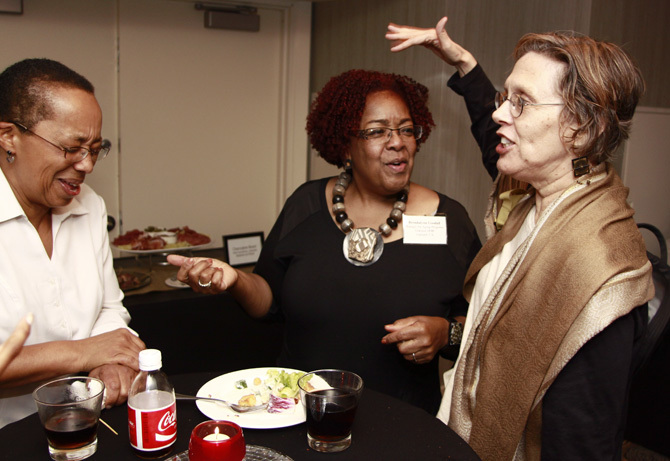 Helena Bushong, Trans-elder Community Advocate/Activist and Jewelle Gomez, Dir., Horizons Foundation. Glen Francis, Exec. 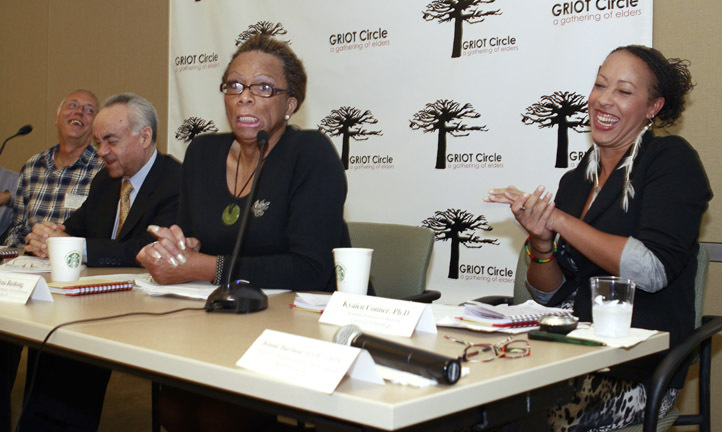 Dir., GRIOT Circle and Nancy Bereano. 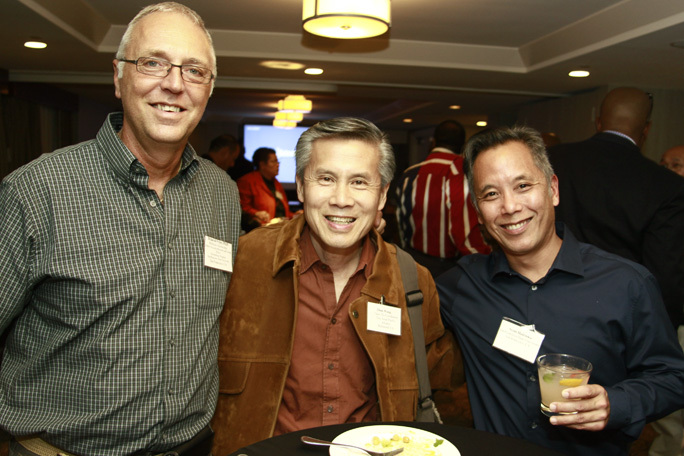 Brian de Vries, Ph.D., prof. of gerontology, San Francisco State University, Dion Wong, coordinator, Gay Asian Pacific Alliance, and Scott Haitsuka, BASW, MSW intern. Nancy Hinds, Brendalyn R. Goodall, MSW, and Marta Ames, Deputy Dir., Senior Service America. 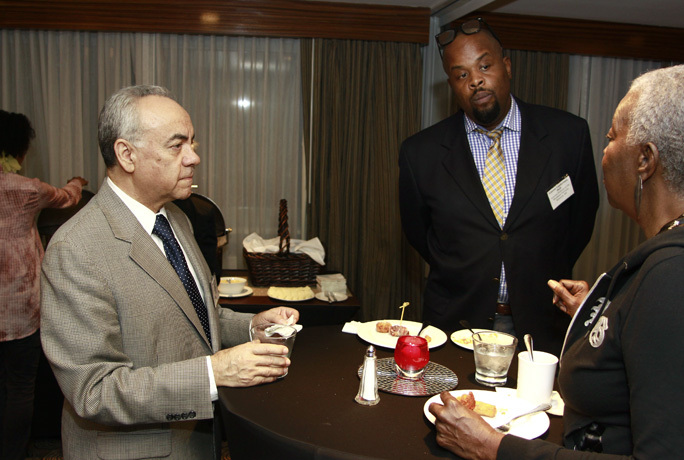 Glen Francis, E.D., GRIOT Circle, Pauline Park, Chair, New York Assoc. for Gender Rights Advocacy, Helena Bushong, Trans-elder Community Advocate/Activist, Michelle Alcedo, Hope Barrett, MPH, Center on Halsted, and Scott Haitsuka, BASW, MSW intern. Curtis Lipscomb, Exec. 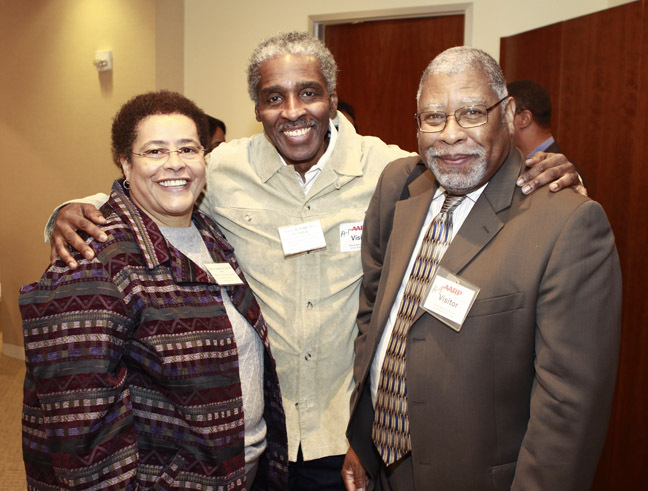 Dir., KICK-The Ageny for LGBT African-Americans, Donald Burch and (at far right) Nancy Bereano. 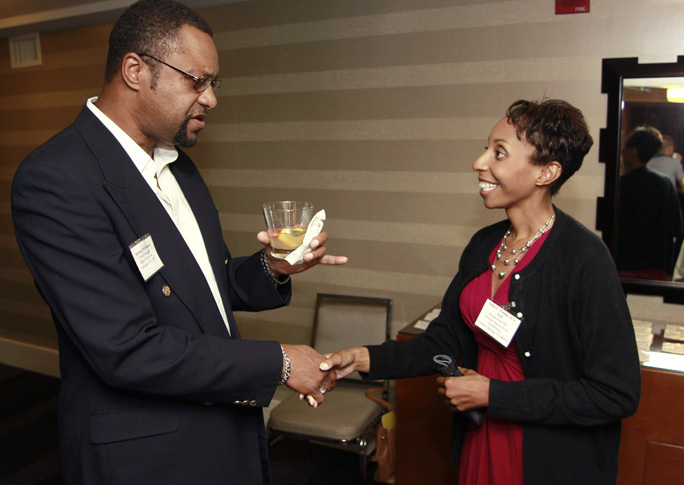 Anthony McPhatter, Fiscal Manager, GRIOT Circle and Aisha C. Young, M.A. AAC, Pres. & CEO, African-Americans in Gerontology. Mario E. Tapia, E.D., Pres. 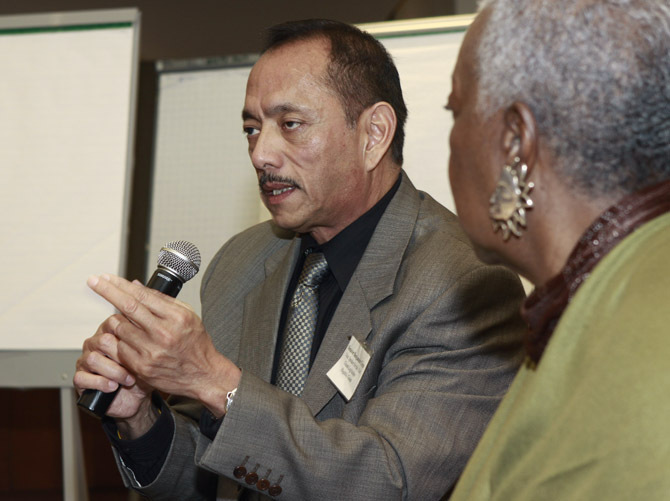 & CEO, Latino Center on Aging, Laurens Van Sluytman, PhD, Assoc. 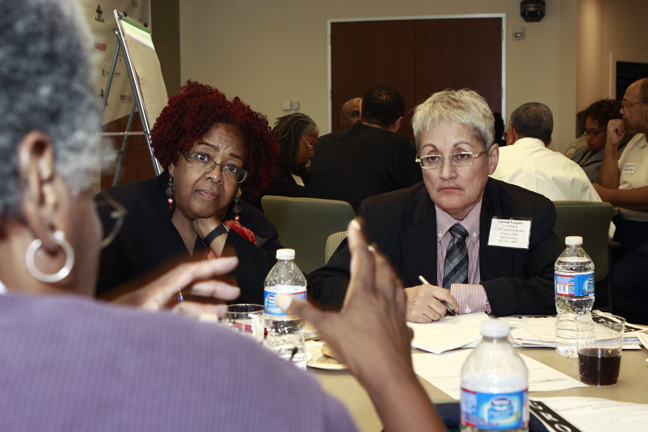 Professor of Social Work, Morgan State College and Bonnie Harrison, MSHC, LMHC, Dir. 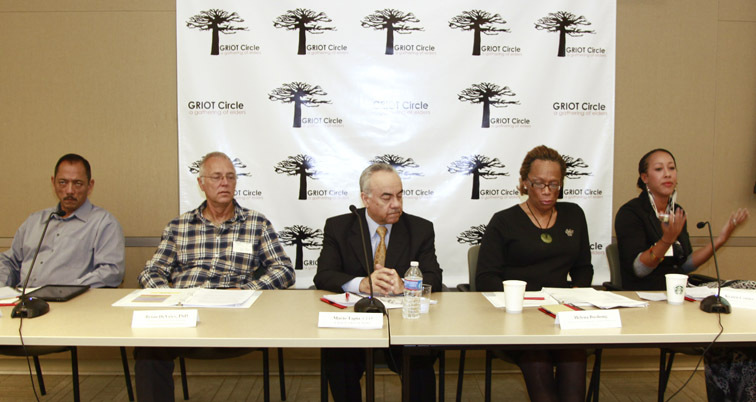 Program Services and Evaluation, GRIOT Circle. Nancy Hinds and Don Kao, Director, Project Reach. National Convening participants at opening reception view short films presented by the Center on Halsted in Chicago, GRIOT Circle of Brooklyn, and Michelle Alcedo of Openhouse-San Francisco.